“. . . 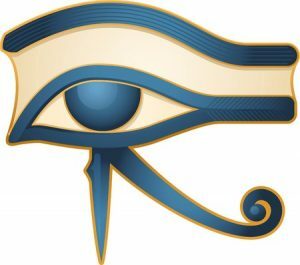 The Egyptians simply give the name of Osiris to the whole source and faculty creative of moisture, believing this to be the cause of generation and the substance of life-producing seed; and the name of Seth they give to all that is dry, fiery, and arid, in general, and antagonistic to moisture. . . The Loss of Osiris is now celebrated in the Abu Sefein Mouled at the same time and with the same traditions; i.e. a big feast followed by a 40-day cycle of figurative death by fasting and other disciplinary means. => 28 days after the Last Supper is the birth/rebirth of the renewed king on 25 December. => 40 days after the Last Supper is Epiphany. Osiris’ life, being a symbol of the moon, is associated with a cycle of 28 days (4 weeks). This was echoed later in the Christian Advent, which, in ‘Latin’, is ad-venio, meaning to come to. The Catholic Encyclopedia admits that: “Advent is a period embracing 4 Sundays. The first Sunday may be as early as 27 November, and then Advent has 28 days.” As noted above, 27 November is the date of the symbolic Last Supper, Death, and Loss of Osiris. All the above elements are of Ancient Egyptian origin. Such traditions were observed during (and in fact were based on) the annual jubilee of the Ancient Egyptian King, known as the Sed (or Heb-Sed) Festival, which was always held during the month of Kee-hek (Khoiakh, i.e. December) every year. This festival dates from time immemorial, and continued to be celebrated throughout Ancient Egyptian history. The intent of this annual event was the renewal/rejuvenation of the supernatural powers of the [reigning] King. The renewal rituals aimed at bringing a new life force to the King; i.e. a (figurative) death and a (figurative) rebirth of the reigning King. 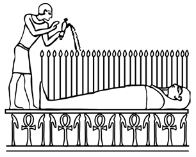 In Ancient Egyptian traditions, the rejuvenation/birthday of a new/renewed King symbolically comes 28 days after 27 November, the symbolic Last Supper and the Death of Osiris; i.e. 25 December. The Christian calendar celebrates the same day as the birth (rebirth) of the new King, namely Jesus, who is referred to as a King throughout the Bible. The 28-day cycle signifies the Advent (both in Ancient Egyptian and Christian traditions) of the King. 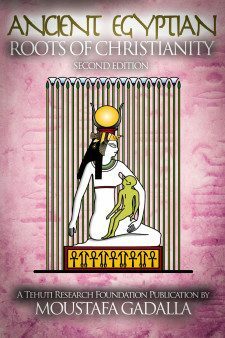 All the elements mentioned in the Catholic Encyclopedia mentioned above concur with their Egyptian origins, whereby Osiris incarnates as Horus and Osiris became the judge of the dead. Due to the absolute lack of historical and archaeological evidence to support the biblical accounts of Jesus’ birth, life, and death, and in order for the Christian church to set a birth date of some kind, they turned to Egypt. Practically all churches picked their dates from an Ancient Egyptian list which was attributed to Clement of Alexandria. The list places several dates: 25 Pachon (20 May), 24 or 25 Pharmuthi (19 or 20 April). Clement, however, indicated that Epiphany (and with it, probably the Nativity) was celebrated on 15 or 11 of Tobi (10 or 6 January). 6 January is proven to be the date adopted for his “birthday” throughout the various churches in the Mediterranean Basin. 25 December came later. and was based on the Julian calendar, which is 13 days behind 6 January.